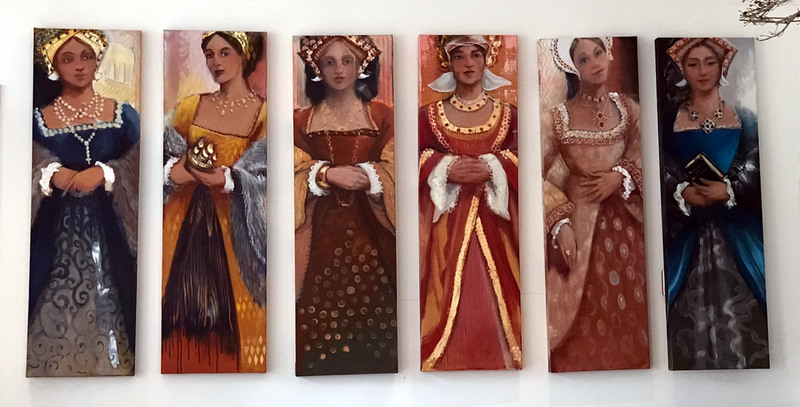 The Archbishop’s Palace in Southwell is hosting a small art display throughout April of ‘Wolsey’s Angels,’ alongside canvases of ‘The Six Wives of Henry VIII,’ by artist Claire Fried. The Angel Paintings are in response to Florentine sculptor Benedetto da Rovezzano’s four bronze angels, commissioned by Thomas Wolsey in 1524, as part of a magnificent tomb in the Renaissance style, reflecting Cardinal Wolsey’s wealth and statesmanship. The angels, each measuring a metre in height, were created between 1524 and 1529. See below for more about the history of the angels. Each composition measures 30cms x30cms in oil and charcoal on board. There is also Bronze Angel 1 – back view (30x60cms) and Bronze Angel 2 – back view (30x60cms), and Four Angels with Wings (120x90cms). “In response to these beautiful bronze sculptures, I started to draw and paint. I love their colour patina, their texture, and individual facial characteristics, and fascinated not only by their story ‘Lost and Found’ but the curious ‘slots’ in the form of a cross on their backs for the wings they would have had originally. “I created a series of paintings to portray the heads of the four angels, the intriguing back views and a group imagining the wings. ‘The Six Wives of Henry VIII’ is a group of six canvases painted by Claire at the beginning of 2017 in oil. The idea started in November 2016 when she was searching for an idea for her Diploma show. From childhood the stories of Henry VIII marked her imagination and she was moved when Lucy Worsley made a programme for BBC 1 revealing new stories about the queens. Claire wanted to see them all together in a new light. BA in Art and Design – 1st class Honours, and gaining the Pratt Award for Creativity. She was a Fashion Designer in Paris from 1977 – 1991 (Dior, Givenchy, Junko Shimada, Emmanuelle Khan, Sonia Rykiel). The Four bronze angels were commissioned in 1524 from the Florentine sculptor Benedetto da Rovezzano as part of a magnificent tomb in the Renaissance style, reflecting Cardinal Wolsey’s wealth and statesmanship. The angels, each measuring around a metre in height, were created between in 1524 and 1529 – a period in which Henry VIII was seeking to annul his marriage to Catherine of Aragon. Wolsey’s inability to persuade the Pope to annul the marriage led to his fall from power and he died in 1530. Along with the rest of Wolsey’s possessions, most of the tomb (including the angels) was appropriated by Henry VIII who intended to use it for himself. However Henry VIII did not see the tomb finished. Each of Henry VIII’s three children expressed their intention to complete the memorial posthumously, but failed to do so. Elizabeth I moved the angels to Windsor in 1565, where they stayed until 1645. During the civil war elements were sold to raise funds and until recently only the black stone chest, later used for Admiral Lord Nelson’s monument in the crypt of St.Paul’s Cathedral and four bronze candle sticks were thought to have survived. The existence of the angels remained unknown until two of them appeared in an auction in 1994, unillustrated and catalogued simply as being ‘ in Italian Renaissance style.’ They were acquired by a Parisien dealer and later the Italian scholar Francesco Caglioti convincingly attributed them to Benedetto. In 2008 the remaining pair of angels was discovered at Harrowden Hall, a country house in Northhamptonshire, now owned by the Wellingborough Golf Club, where all four angels once stood on top of the gateposts. Benedetto da Rovezzano(1474-1554) was a contemporary of Michelangelo and was described by Giorgio Vasari as ‘among our most excellent craftsmen.’ He worked in England between 1519 and 1543 where his pre-eminant patron became Cardinal Wolsey.